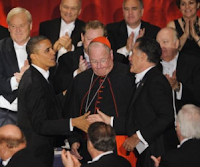 Today both presidential candidates participated in the Archdiocese's Al Smith dinner which was hosted by New York's Archbishop, His Eminence Cardinal Timothy M. Dolan. The dinner is an event that political candidates love to participate in for selfish reasons. The photo opportunities and how they can steer votes is a major reason for accepting an invitation. Both candidate spoke and exchanged one liners which were hilarious. I personally enjoyed Romney's joke about Biden laughing at anything and "In the spirit of Sesame Street, the president’s remarks tonight are brought to you by the letter O and the number $16 trillion.” Obama also made a good one when he said, "Please take your seats, or else Clint Eastwood will yell at them." A recent gallop poll showed Romney leading Obama. Apparently, the second debate helped Romney. I think Romney's witt has showed a side of him many Americans are not used to seeing due to the bias in the media which he too joked about.